I’m stuck in a cycle of baking the same old recipes because everyone loves them, and eats them which isn’t so bad really. But things can get stale – so I’ve been branching out. It’s not always successful as I discovered with the Lumberjack Cake. A moist, dense combination of apples and dates with a delicious caramel coconut topping. However, it sat on the cake stand half uneaten because half the family liked it and half didn’t. But the real reason was that the recipe, I think, was flawed. I could taste the baking powder/soda and this tainted the flavour enough to render it… unpopular. Recipe books are like that though – mostly filler. I hardly buy them anymore because I’m convinced that no single human can have so many rock-solid, new recipes to fill a book. There’s always going to be those recipes that had to be forced out and pushed through with no real committment or enthusiasm. You always know when you’ve made one of those recipes. Moving on – I have a compilation of recipes from the New Zealand Edmond’s Cookery book that my Kiwi mother gave me many years ago. This book means business – there’s no photos and there’s 3-4 recipes per page. I haven’t and likely won’t try them all. But there are some very reliable recipes in this little book that’s falling apart with use. 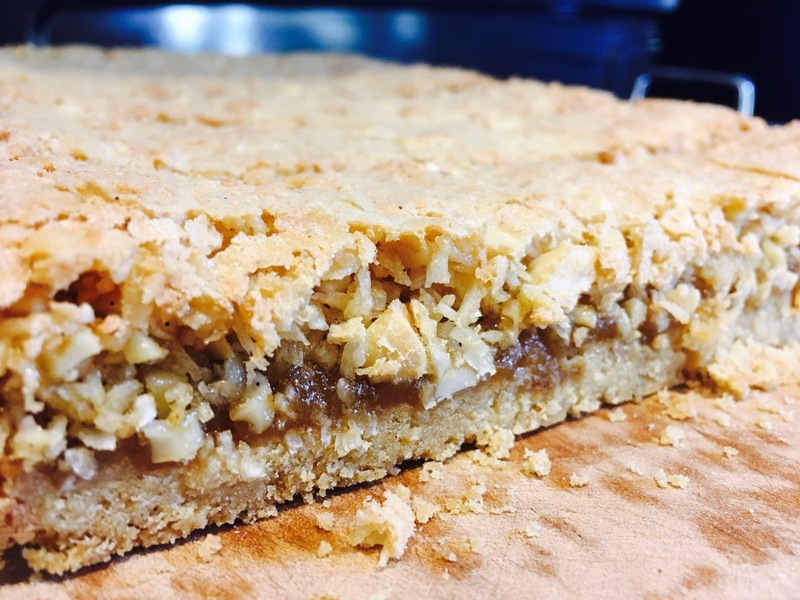 If you’re looking to branch out, perhaps make something different from your usual Millionaire Shortbread or choc-chip cookie then this is the recipe for you. It’s easy to make, and you’ve likely got the ingredients handy. Original recipe simply calls for ‘nuts’ and I felt peanuts would overpower the coconut so I used cashews. You could use whatever nut you wanted really. I like this recipe because it’s not too sweet and because it crumbles nicely in the mouth with just enough chew to hold it all together. I made this on Sunday and there’s 2 tiny slices left. The public has spoken. Cream butter and sugar and mix in flour and baking powder. Press the base mixture into a lined slice tin (swiss roll tin) and bake till golden (5-8minutes) and then turn the oven down to 160C. To make the topping, beat the eggs and then add sugars and beat until thick. Mix in the rest of the ingredients gently and pour on top of the base. Bake for about 30 minutes, or until the top is golden brown and set. Leave to cool before slicing into pieces.